Recently, I reviewed Karen Memory by Elizabeth Bear (spoilers: I was a fan!). I think it's safe to say that Karen Memory uses an alternate history, and yet it is still set (more or less) in the same United States as existed at the time, complete with some more historical characters (as described in your afterword). Why did you choose to to use the "real" past instead of a second world or completely fictional location? It’s interesting that you describe it as the “real” past, because I think of it as anything but. I was actually looking for the freedom of not having to stick too closely to history. Real historical fiction is rigorous and exhausting to write. I’d call it a more exacting subgenre than hard science fiction! Similarly, is there something that drew you to the Western (or steam-Western) as a form to tell your story? Can you imagine these particular people with these particular problems in any other setting? There’s also the issue of Karen’s voice: she came with that more or less installed, and it would take some fairly serious circumlocutions to justify that voice just about anywhere else. Also, the story itself derives heavily from the forms of the pulp western and tall tale; while it’s possible to take such a story and move it to a different environment, it is a kind of stunt writing. I set the story where it seemed to me that it naturally fit, I guess. Karen is the only viewpoint character in the novel, which is filled with amazing characters. Were you ever tempted to give any of the other characters a viewpoint? You know, not even a little? It’s her story. I spent a lot of the early part of my career writing single-protagonist single-POV novels and then having to go back and add details and points of view to make the narrative make sense. I guess I’ve finally gained enough skill as a writer to be able to do things the easy way! Along the same lines, do you feel you have more stories to tell with Karen Memory the character? Or, if not her, with someone else from the novel (please say yes please say yes)? Maybe? I’m currently contracted out through 2018, so it would be a while in any case! I do have an idea for a short story, which I should probably be working on RIGHT NOW. When doing research for the novel, did anything really surprise you about the time period/setting you were looking into? Was the setting something you already knew a lot about? I’m afraid that at this point, very little about history surprises me. I did really enjoy reading about some of the lesser-discussed aspects of the history of the American west, like the culture and history of the Comanche from their own perspective (in as much as I was capable) and the largely erased historical demographics of the American West. How did you approach "historical accuracy" in regards to writing this book? Obviously the giant, mechanical squid isn't "historically accurate," but were there things that you really wanted to make sure were more "historical" and others that you didn't care so much? What I wanted to get right was the culture and the cultural mix; the world the characters lived in and its attitudes and their experiences, inasmuch as anyone can ever represent fully the experience of anyone who is not themself—or even themself, for that matter. We are all vast; we contain multitudes. I have to say, I love how the book handles death (in that, there's [spoilers?] not a lot of it). Life is not cheap in your setting, which is something that I found very real and refreshing. Does that reflect a philosophy for you as a writer or was that something you were trying to explore with this book in particular? I think if life is cheap than death is meaningless, and stories then to become boring. I’ve never hesitated to kill a character when I felt there was a dramatic necessity for it, even if it was just the dramatic necessity to show that life is not fair and getting into fights is dangerous. And I feel that there are books that are absolute bloodbaths that are also emotionally very effective—a certain Suzanne Collins series springs to mind. I was in love with death too, when I was fifteen or sixteen and it was mysterious and fascinating. Now I know that it’s horrible and grubby and humiliating and sad, and the only thing good about a death is—possibly—the choices we make leading up to it, if we have the privilege of choosing and not just getting squished by a runaway Zamboni or something equally humbling and arbitrary. Well, that got dark fast! This was the first of your books that I've had the pleasure of reading. For those like me who are new to your writing and want to read more, do you have any recommendations for which of your works we should read next? Hah! Well, thank you. 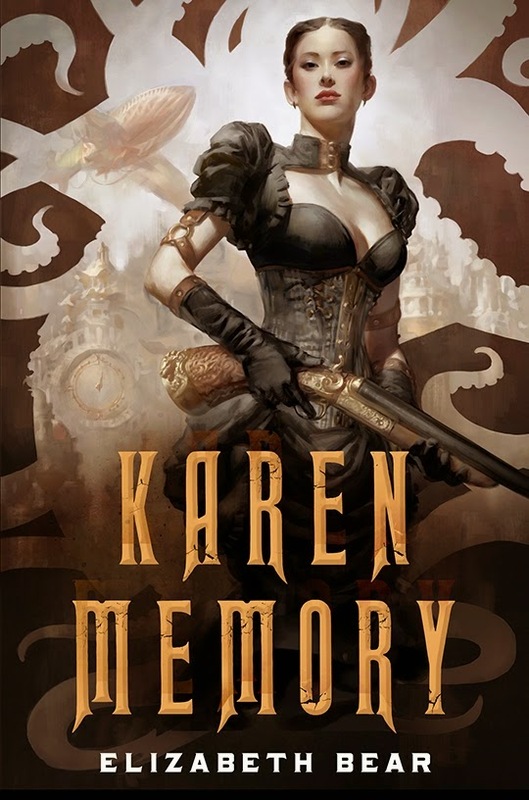 Karen Memory is not much like anything else I’ve written, but I think Range of Ghosts should be a good match for people who like fantasy, and New Amsterdam for people who want their steampunk itch scratched, and Carnival for those who like science fiction. A huge thanks to Elizabeth Bear for taking the time to answer these questions. Anyone looking for more information on the author can check out her blog. POSTED BY: Charles, avid reader, reviewer, writer, and contributor to Nerds of a Feather since 2014.